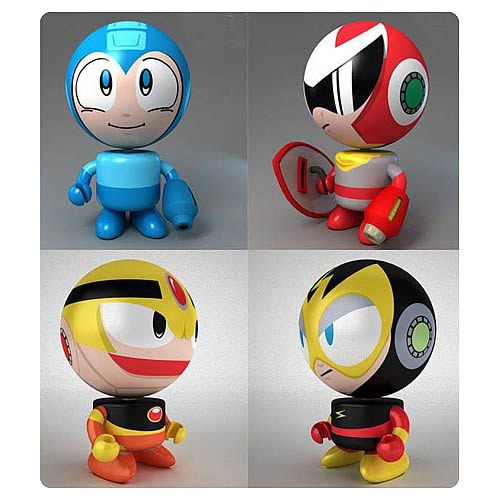 Shopping for Mega Man Bobble Heads? It's Mega Man, Proto Man, Guts Man, and Elec Man from the Mega Man video game series! Each figure stands 3 1/2-inches tall and captures the retro feel of the original Capcom games on NES. Mega Man, Guts Man, and Elec Man all made their debuts in the original Mega Man, but Proto Man didn't show up outside of prototype form until Mega Man 3. Now's your chance to own them all as awesomely designed bobble heads that make great office and home decoration! Ages 5 and up. Not only do they bobble but they feature unique sculpted weapons specific to the characters and their in-game game attributes.